Bizzy Bear travels under the sea. 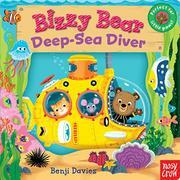 Little readers join Bizzy Bear and a few pals in a submarine to travel to the darkest depths of the ocean in this interactive board book. Readers are encouraged to slide a variety of panels that submerge the sub, open a clam, and explore a sunken ship. The journey ends with the discovery of a lost treasure, but that's never the explicit point. All emphasis is on the exploration of the undersea world, and the illustrations are filled with fish, crabs, turtles, and other ocean residents. The bright colors and rounded illustrations provide a welcoming tone, pulling little ones in to the world with ease. The panels are so sturdy and well-engineered even the most excitable readers will be able to move them up and down without fear of destroying the book.